Between September 2002 and March 2005, Russell Hoban contributed to his own discussion forum, The Kraken. In the second of a 2-part feature (part 1 is here), Richard Cooper looks back over a selection of his posts. Hi. I don't know how many krakenistas are bat-friendly but here goes. There is a Cornwall Bat Hospital run by Ginni Little, a gallant woman who has taken sick and injured bats to her bosom. The hospital was started in 1987 but her efforts go back further than that. She runs the hospital with the help (when available) of volunteers but the place is always in need of funding and Ginni is always overstressed with keeping it going. All of the charities that appeal to you are likely to get more contributions than this one brecause most people don't appreciate bats. You can google to the Cornwall Bat Hospital where you will find that you can adopt a bat (and probably save its life) for as little as £15. I have fallen in love with bats and I'm a patron of the hospital. Think about bats. Think about Ginni. Have a good Christmas. Do good things in 2004. That's a wonderful owl story. As you know, I'm a heavy owl user in my writing and I'm strongly pro-owl in general. Years ago when I lived in Wilton, Connecticut, a female snowy owl blew in from the north and perched in a tree not far from the house. My daughter Esme still remembers being woken up by me to go out for a look at this wonderful and mysterious bird. It was an unforgettable thrill for both of us. I've never seen a great horned owl outside of a zoo.The German word for the GHO is Uhu. Owlnomatopoeia. Onward into the new year, I alerted the group to a page-long article on Hoban and SA4QE, for which I was interviewed, in a short-lived supplement with The Independent on Sunday called Talk of the Town. This appeared a few days after that year's annual birthday event. Russ seemed very happy with it, and asked "How did you make this happen?" I wish I could say that I'd bullied and cajoled the newspaper into printing the piece, or even that they themselves had rung me for a quote on a feature they were doing off their own bat. The truth was that some time before I had been trying to get work as a freelance writer and had proposed a feature to The Independent, who at that time were particularly culture-friendly, on Hoban and SA4QE. I never heard back from them, but prior to the 2004 event I was contacted by an Independent journalist, Robert Hanks, who asked to talk to me. We met in The Cheddar Cheese at Tower Hill, the site of a scene in The Medusa Frequency, and although that went very well I didn't quite know what to expect until the article came out. So while I was slightly annoyed that the paper had quietly farmed out my proposal to one of their own, it wasn't entirely surprising given that I had no journalistic credentials whatsoever, and it was great to be interviewed and even better to see another article on Russ published if not nationwide then city-wide at least. The article was print-only and never officially appeared online, but I put a scan and text versions on the SA4QE site here. "I had not a dispute but a disquisition, with Dilke on various subjects; several things dove-tailed in my mind, and at once it struck me what quality went to form a Man of Achievement, especially in Literature, and which Shakespeare possessed so enormously - I mean Negative Capability, that is, when a man is capable of being in uncertainties, mysteries, doubts, without any irritable reaching after fact and reason - Coleridge, for instance, would let go by a fine isolated verisimilitude caught from the Penetralium of mystery, from being incapable of remaining content with half-knowledge. This pursued through volumes would perhaps take us no further than this, that with a great poet the sense of Beauty overcomes every other consideration, or rather obliterates all consideration." For me, the sense of Strangeness overcomes every other consideration and, when fearlessly explored, leads to recognitions beyond the limited reality consensus. For me, The Princess and the Warrior succeeds in this, as does Junkmail. I could add others to the list. 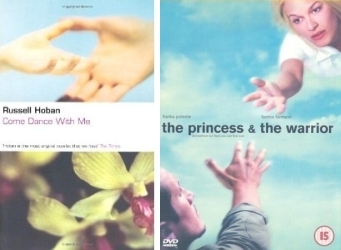 I'm not sure the film was ever actually referred to in a Hoban novel, but the cover design of Come Dance With Me had curious echoes of the DVD cover/film poster for The Princess and the Warrior. Along with Kieslowski's The Double Life of Veronique and Three Colours films (White has echoes of Kleinzeit and was Hoban's own favourite of the trilogy), Princess is quintessential viewing for any Hoban fan, and a superb European indie film in its own right. You can see a trailer here. i've been looking at Judy Tihany's SA4QE entries. All of them with love and good wishes from a person I've never seen or spoken to. She was a musician and performer and I never heard her music, never saw her perform. But the love. Who can define the emotions that go out from us or come in to us. Reading all kinds of books, not all of them first-class, I find tears running down my face at various scenes. Cigarette dies shielding Bertie Cecil from the firing squad in Under Two Flags; Sidney Carton mounts the stairs to the guillotine in A Tale of Two Cities; The dwarf sees himself in a mirror in The Birthday of the Infanta. Love exists in words, is evoked by words, goes to and comes from persons who never existed. But it's real. And the love from and to real people is real wherever they are and however they are, alive and dead. The love from Judy is real and my love that goes to her now is real. Love is a mystery. The Kraken! Rising from the blackness of the uttermost deep to embrace me. Who else has such a companion? There’s been nothing like it in my life before: a geographically scattered gathering of kindred spirits, most of whom I’ve never met face to face, all of them wishing me well round the clock and all of them keen to ask and answer questions, supply information, give notes and photographs for my researches and generally armour me with good vibes, unflagging encouragement and birthday bottles of ardent spirits. Thank you, Kraken. I am proud to call you my friends. so the mini-Cooper thought he'd better show. now the world is very pleased with little Joe. what gave me the most satisfaction was seeing how you enjoyed one another's company and feeling all the love in the Nomad. And reflecting that it was my books that brought you together. I feel pretty good about that. Hi everybody. I think it might be a good idea for me to withdraw from The Kraken. You should be able to talk among yourselves without being aware of my constant presence. It isn't good for the group and it isn't good for me. Anybody who wants to contact me off-Kraken is welcome to. All of you have my e-mail address. Looking at the posts leading up to this, I can't see anything that might especially have prompted Russ to leave, although activity on the group had been quite intense around that time, and he was likely overwhelmed by all the attention. The Kraken site records over 200 posts that month, where the average was around 40 or 50. Message traffic in the group's 16-year history was only ever as high in the few months after Hoban first joined and after he died. When he said "it isn't good for me", I wonder if he was finding the Kraken too cosy, afraid all the group-hugging - as much as he was clearly touched by it - might cause him to lose his edge. Perhaps he was feeling that he'd now become a "normal" group member, posting his own fun contributions just as the rest of us did rather than using the forum to ask for help or answer queries as he had in the early days. Whatever the reason, we were grateful he'd been there. Tributes from the group followed, Yvonne Studer thanking him for joining the group "for as long as it felt right for you", while Lindsay Edmunds wrote, "I cherish the time you have been on the Kraken. It has been a brightness." The Kraken these days is quiet, and appears to be used by its members more as a newsletter than a discussion forum, with maybe a dozen messages posted each month, mostly by myself and Dave Awl updating the community on things going on in the world of Russell Hoban. While I now run russellhoban.org and co-manage the Twitter account, and Dave does a grand job managing the Facebook page, I still miss the group as it was back in its heyday, as it had a real sense of community which social media only nominally replicates. The number of "fans" may now be larger elsewhere, but with a newsgroup anybody can post, and those posts come direct to your inbox, so their authors become familiar and you feel you're taking part in an ongoing conversation. Facebook pages and Twitter feeds by contrast are powered only by the one or two people who run them, so their activity is dependent on the availability of a tiny group of managers. If a manager can't take part for a while for whatever reason, the conversation dies, which doesn't happen in newsgroups and bulletin boards. Hashtags and searches may be a quick way to get a snapshot of interest in a topic on social media, but the results don't go back very far, and the whole thing is a contextless cacophony. I wonder if any other writer anywhere has a bunch of friends like you. Voices in the night (that's how I always think of you) from far away, good friends being with me as I spell my life out one letter at a time trying to put down on paper what a strange thing it is to be alive... If you all have gotten something from my books, know that you are with me in the writing of whatever books I can do from now on. The Kraken is a deep thing. Richard Cooper is a moderator of The Kraken, webmaster of russellhoban.org, co-organiser of the Hoban 2005 convention and winner of the Richard Walking Challenge Cup 2003.